Since 1964, Jigokudani Yaen-koen has been loved by many people from all over the world. 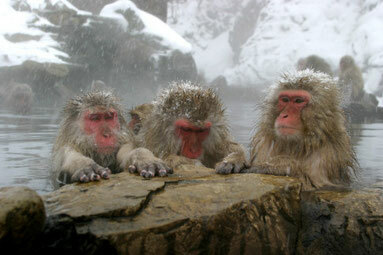 You can enjoy watching wild Japanese monkeys bathing in natural hot spring. Jigokudani Yaen-koen is only about five minutes by car from the hotel. Please take a bus or a taxi from the hotel. Shibu Onsen is a nostalgic Japanese spa town. It was called Hirao Onsen a long time ago . It has been popular since around 1,300 years ago when priests from temples in Kyoto discovered the healing effects of the hot springs. The town has 9 public bath houses and 2 foot baths. They all have different sources and medical effects. Guest staying at the hotel can visit these baths free of charge.